Luca Fappani and Spooks N Jewels dominated the Derby Non Pro at the 2018 Reining By The Bay, sweeping levels 4, 3, 2 and 1 as well as taking the Youth 13-under Championship. WOODSIDE—From the venue to the competition to the prize money, the Reining By The Bay is spectacular. This year’s 20th anniversary version, held July 23-29 at the Horse Park at Woodside, was no exception—so it was the perfect place for Luca Fappani to explode on the scene. The 14-year-old son of Andrea and Tish Fappani, riding Spooks N Jewels, dominated the $55,000-added Non Pro Derby, sweeping levels , 3, 2 and 1. He also took the 13-under Youth Champiopnship. 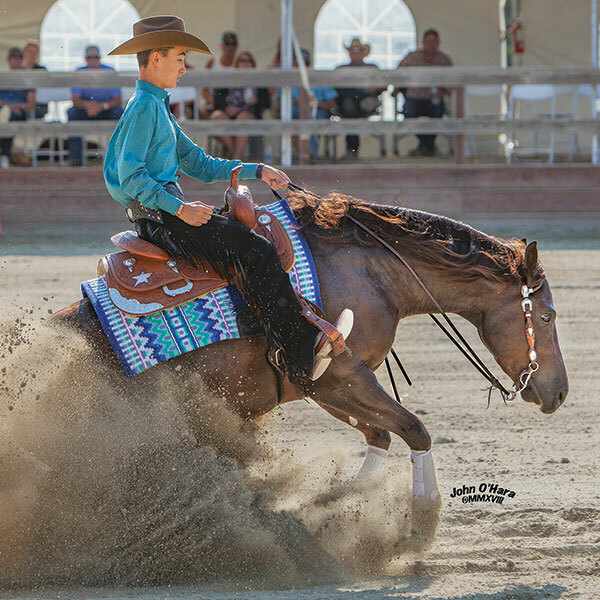 All told, the teen-ager topped 45 other non-pro entries and boosted his career earnings—after just two years of competing—to almost $28,000. All but about $5,500 of that came from his Non-Pro titles in California. Luca’s dad, Andrea Fappani, fared well, too, winning both the $130,000-added Open Derby L4 title on Chic Dreamin, owned by Silver Spurs Equine, and the $65,000-added 3-year-old Open Futurity L4 crown on Designed To Spark, owned by Rancho Oso Rio, LLC. He also took the Open Futurity L Reserve on Diamonds In My Genes, owned by Rhodes River Ranch. Mike Boyle of Ione won both the the Futurity Open L2 and L3 titles on Donttakeurgunstotown, owned by Kelly Keenan, Boyle’s niece. “You never know how it’s going to go on the futurity horses, but he was right there for me,” Boyle said of the Gunnastrashya son, out of Gunnalena. A surprise this year was a clean sweep by the soft-eyed, 20-year-old chestnut gelding Royal Montana, (Peptoboonsmal x Marjorie Montana)—from bloodlines not often seen in the reining industry compared to cutting and reined cow horse arenas. Owned by Jennifer LeMere, Royal Montana has been part of her life for 17 years, survising a colic surgery in 2011. The duo won the Intermediate Non Pro and Limited Non Pro High Point Divisions. “He is that once-in-a-lifetime horse for me!”, she said. “We weren’t sure he would make it through surgery, and almost losing him made me realize not to waste time and to start checking off my bucket list events.